On Thursday, Russian President Vladimir Putin fired back against allegations by America that Russia has any intention to meddle in the upcoming U.S. Presidential election. During a meeting with international foreign policy experts in Sochi, Putin dismissed the finger pointing from U.S. elites blaming Russia for the hacks on top democratic leader’s email accounts as hysteria made up to distract from the country’s real issues. 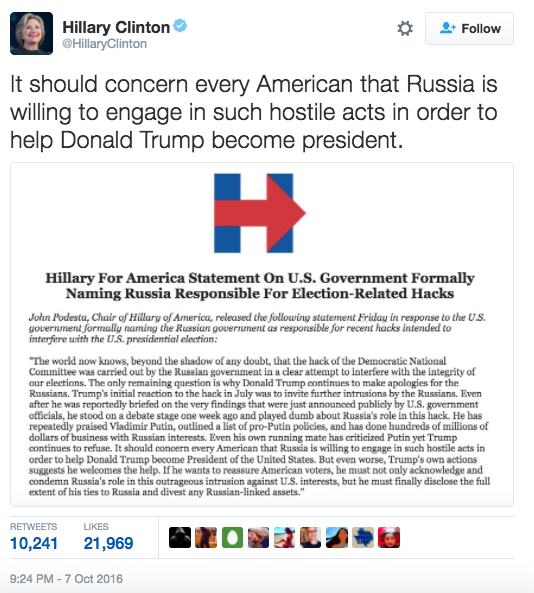 Democratic Presidential Candidate Hillary Clinton and her team has continuously blamed Russia and the Kremlin for having a hand in the handful of email hacks that their people have fallen victim to. The Democratic National Committee, Clinton’s campaign chair John Podesta, and Hillary Clinton herself have all had private emails stolen and posted on Wikileaks for the world to see. The substance of the emails, sometimes showing incriminating and nefarious dealings, was said to be hacked and shared with the public under the direction of the Kremlin in order to rig the U.S. Presidential election in favor of Republican Candidate Donald Trump. “Hysteria has been whipped up in the United States about the influence of Russia over the U.S. presidential election,” Putin told the policy experts. Putin dismissed “the hysteria about Russia’s influence on the U.S. presidential election,” arguing that U.S. elites have concocted the “mythical and fictitious” claim as a means to turn public attention away from real issues such as Government debt and police violence. “It’s much simpler to distract people with so-called Russian hackers, spies, and agents of influence. Does anyone really think that Russia could influence the American people’s choice in any way? 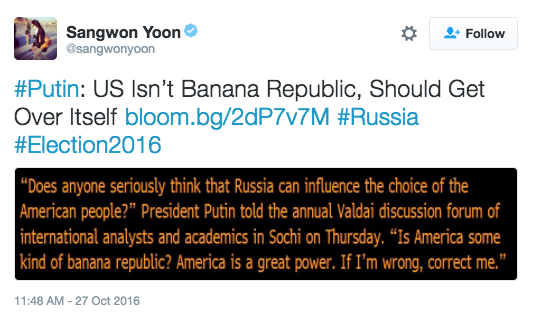 Is America a banana republic or what? America is a great power,” he said. The Russian President took it a step further to combat American leaders’ fears of Russian military aggression saying that such a claim that their country has such intentions is “ridiculous” and that Russia is not planning on attacking anyone.